Whether you’re looking for a new hobby, you need a change in your life, or you just feel like doing something you’ve never done before, there are many opportunities to learn something new in Toronto. Classes and workshops abound in a variety of mediums, from artistic to active. Here are nine new things you can learn in the city. If you’ve ever looked at objects made from blown glass and wondered how they came to be, or just simply wondered how the words “glass” and “blowing” even go together, now you can find out for yourself. At glassblowing studio Playing with Fire you can try your hand at creating your own original glass art, no experience necessary. What you can make may vary but in an introductory class workshop you might find yourself making a wine bottle stopper, glass heart, paperweight, tumbler or a glass flower. There are several places in Toronto where you can finally learn to knit that sweater or scarf you’ve always wanted to make for yourself (or someone else). 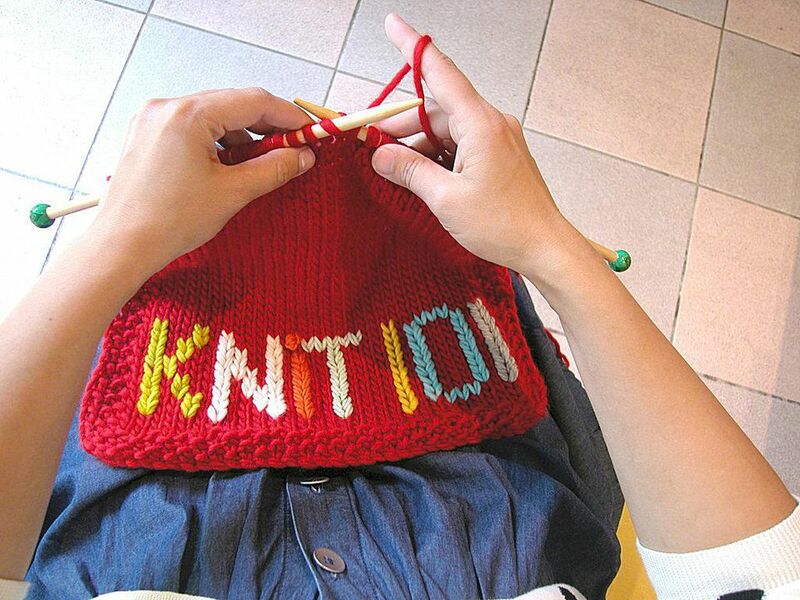 The Knit Café offers classes for absolute beginners including knitting 101 and other beginner classes where you knit a scarf or a headband. Other places to learn to knit in Toronto include the Toronto Public Library (various locations) and The Purple Purl. If knitting isn’t your thing or you’d rather trade knitting needles for a sewing machine, you have a few options in Toronto where you can learn the basics of making, altering and mending your own clothing. At The Make Den you can start with a sewing fundamentals class if you’ve never used a sewing machine, or an intro to sewing garments if you need a refresher. From there, you can move onto actual garments, tailoring and mending, depending on what skills you're looking to pick up. The Make Den recently moved from their spot in Bloordale over to Sterling Road. Get a full body workout, meet some new people and learn a new skill by hitting up one of Toronto’s many rock climbing gyms. Boulderz Climbing Centre has two locations in Toronto including one in the Junction Triangle and one in Etobicoke. They offer climbing and bouldering for all levels (bouldering doesn’t use ropes and there is no belaying) in the form of drop-ins and scheduled lessons. Other Toronto rock climbing gyms include Joe Rockheads and The Rock Oasis. Why buy a new ring or necklace when you can make your own? At a six-week beginner silversmith course at The Devil’s Workshop you'll learn how to make your own sterling band ring, but many students are able to complete one or two more projects in addition to the ring. They also offer a popular wedding band workshop wherein couples can sign up to make their own wedding bands (which sounds pretty romantic). You can also try Anice Jewellery, which offers a few workshop options to choose from, plus a Girls Night Out package for groups looking to learn some jewllery-making together and featuring wine and snacks. Kid Icarus in Toronto’s Kensington Market offers regular screen printing workshops open to six to eight people at a time. Each workshop is four and half hours and in it you’ll learn the basics of designing art for screens and come away with a greeting card or small art print along with the knowledge of printing techniques and building screens. Put the vase you made in eighth grade art class to shame by enrolling in a pottery-making class where you can learn some new skills and make something even better. The Gardiner Museum offers drop-in clay classes Wednesday and Friday from 6 p.m. to 8 p.m. and Sunday from 1 p.m. to 3 p.m. Classes are suitable for all levels. Tickets for the classes are first come, first served and go on sale 30 minutes before each session. Anyone who loves watching improv can try it out themselves as a way to learn something new and unique. Let loose and test your comedic timing with an improv class in Toronto. You can do a drop-in class at Bad Dog Theatre on a Tuesday at 7 and 8 p.m., no experience required. The area of focus changes from week to week so you can pick up new skills depending on when you visit. The 45-minute classes are only $7. Terrariums, with their intricate display of plants housed in or under glass, are beautiful to look at and make for unique décor items or gifts. You can learn to make your very own with a workshop at Crown Flora. In the Classic Terrarium Workshop you learn the basics of making your own terrarium and learn about different plants being used. When the two hours are up you have two types of terrarium to take home. Stamen and Pistil Botanicals also offers terrarium workshops.